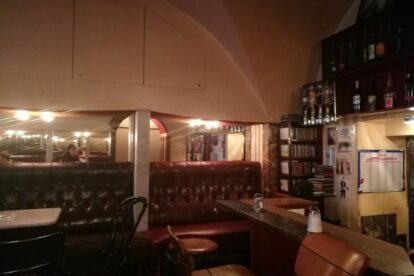 Kleines Café is located right in the beating heart of Vienna and is well-known among us Kaffeehaus lovers. I came here for the first time to celebrate my birthday, rather by accident when randomly searching for an adequate spot to have a glass of wine and share some talks and laughter. Kleines Café turned out to fulfill all our wishes. You’ll find the spot in the oh-so adorable stone-cobbled Franziskanerplatz next to a gurgling fountain. As the name suggests, Kleines Café is modestly sized. People gather beneath the old ceiling’s arcs on comfy leather benches placed on both sides of the tunnel-shaped parlor. City strollers, students and the occasionally dropping by member of the local artistic scene come here to enjoy their portion of caffeine, a frinedly chat, or a calm read with one of the town’s papers in hand. Get here, settle back and submerge in urban coziness. Great things often come in small sizes!